I'm sure a lot of you have heard of Birchbox by now, but let me explain what it is to those who have not. 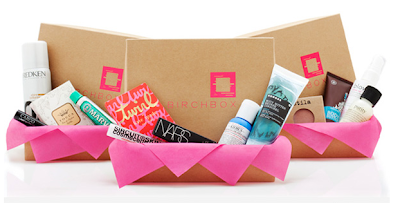 Birchbox is a box filled with beauty samples sent right to your door every month. Usually a selection of 4-5 samples a month from amazing brands like Deborah Lippmann, Too Faced, Zoya, Laura Gellar, and more. Every month of course is going to be different and samples will vary. You can cancel your Birchbox at anytime as well with no charge.I was sent a box to try out and see what I think about the whole concept. With these type of "sample boxes", each month is going to vary. One month you might get an average, not that exciting box. The next month might have a full size product that was way more worth the $10 you spent. That's the whole surprise of each box. From seeing what other people have received in their Birchbox lately, I definitely think they are worth the $10. My box was one of those average boxes, but I am using or have used 5 out of the 6 samples which is great. Some people only get one month, hate their box, and cancel. I feel like you do need to give it a few months and you will most likely get something in your box that you will be happy with. What do you think about Birchbox? Have you signed up or are thinking about it? Thats really gvoood im glad you made this review. I have so many other othings ive been spending money on but 10 for samples is not bad. Funny I was just reading about this on Vogue. It's a good idea but as you said, it varies from month to month. I usually end up using very little of sample products, especially from brands I'm unfamiliar with. Thanks for the review. I love Birchbox. I think it is such a great deal for only $10 a month (I signed up for the yearly plan so it's only $9 a month) and that includes postage! That's what I couldn't believe! In my June Box (which apparently they customize to the questionaire you fill out, because I got different things than some of the other reviews I am reading) I got a full sized Laura Geller Baked Blush and Brighten bronzer in Portofino (this particular color is not as bronzy as your typical bronzer, so fit my complexion well), a sample of Kate Spade Twirl, which I loved, Archipelago Pomegranate guest soap , which I put in my bathroom and have had positive feedback on, Two Deborah Lippman Stripper to Go mitts, which my daughter used one of the packs and really liked (one pack takes off all ten nails' polish, and the packettes are great for travel) and a spritzer of Sircuit Molecular mist, which I love to spritz on before my moisturizer - it makes my moisturizer go further. It all comes in a sweet little box and has everything wrapped in tissue and tied with a bow. I felt as if I was opening a surprise gift! I am so glad I signed up for a year and am thinking of signing on my daughter as well. For what this costs, it is worth $9 a month to get a surprise in the mail every month! I have been looking at a variety of sites reading Birchbox reviews trying to decide if I want to get it, and saw Wheatwife's comment word for word on another website posted under the name Billie. Smells like Birchbox stumping their own product, which makes me nervous about subscribing - if they're going to plant positive comments, why aren't they at least smart enough to make them different? Thanks for explaining! I keep seeing people make references to Birchbox (e.g., "I may need to try that Birchbox thing") but didn't understand what it is. I will have to look into this now! but everyone says good things about Birthbox, no negative comments? The June box was my first birchbox and also so-so, but I had the same feeling...gotta give it a few months then decide. I've seen other people get stuff I'd love to try so who knows? Maybe July will be fabulous!